Traders gather at the post that trades IBM on the floor of the New York Stock Exchange, Oct. 20, 2014. IBM has proven to be an enduringly successful company. Originally founded as the Computing-Tabulating-Recording Company way back in 1911, it adopted its current name in 1924, and in 2018 it still ranked in the top 20 on Forbes' list of the world's most valuable brands, with a value of $32.1 billion. 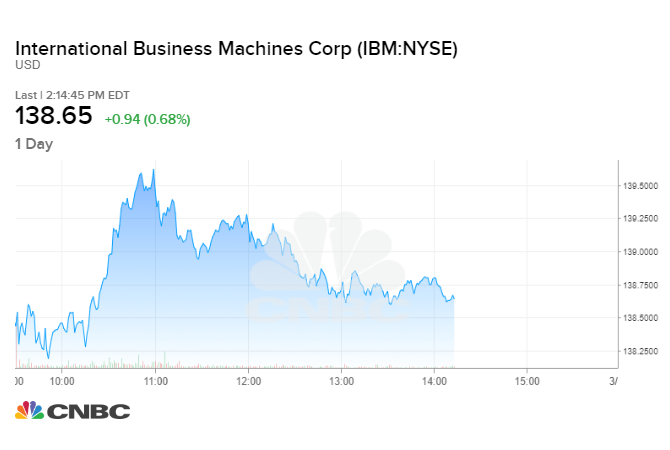 If you invested in IBM 10 years ago, you would have made a profit, although not a very noteworthy one: According to CNBC calculations, a $1,000 investment in 2009 would be worth about $2,000 as of March 12, 2019. IBM actually under-performed the S&P 500. Its total return since 2009 was just slightly above 102 percent. In the same 10-year time frame, the S&P was up more than 270 percent. Any individual stock can over- or under-perform, and past returns do not predict future results. The company has been on an upswing in 2019: It started the year strong by beating earnings estimates and reporting better-than-expected full-year guidance. That's in part due to its largest business segment, Technology Services and Cloud Platforms, which brought in $8.9 billion in revenue at the end of 2018, followed by its next largest segments, Cognitive Solutions, and Global Business Services, which posted revenues of $5.5 billion and $4.15 billion, respectively. The company is looking to build on that success: For all of 2018, IBM generated $13.81 in earnings per share, excluding certain items. This year, it's looking to generate at least $13.90 in earnings per share. Revenue did fall in 2018 compared with 2017, however, per a company statement. And there are some lingering concerns about the market in general after Federal Reserve Chairman Jerome Powell announced the agency would be "patient" in determining future interest rate hikes. As the Fed adjusts monetary policy based on economic growth, some investors have been wary about how it might affect market prospects, IBM chief executive officer Ginni Rometty said last month on CNBC's "Squawk on the Street." While the markets did tick up a bit following the announcement, she said, confidence has remained mostly flat. Overall, IBM's stock is up about 20 percent for the year so far in 2019, and some analysts are optimistic: "We believe the ongoing growth of the Strategic Imperatives unit will return IBM to organic growth in 2019 despite ... currency headwinds," read a note from markets firm Nomura Instinet from early this year. Strategic Imperatives are the company's key offerings, including social, mobile, analytics and cloud. IBM also recently made a deal to acquire open-source software company Red Hat for $34 billion, and Rometty announced the company would open its Watson artificial intelligence service to all cloud platforms, including rival platforms. That will give users the ability to manage data under clouds run by Amazon and Microsoft, among others. "Watson can run on your premise … it can run on any cloud and it can connect between them," she said. "This is a big piece — not just of Watson — a big piece of hybrid cloud. We think that's a trillion dollar market and we'll be No. 1 in it."